Hudspeth County, in the Trans-Pecos region of far-western Texas, is bordered by New Mexico to the north, the Mexican state of Chihuahua to the south, El Paso County to the west, and Culberson and Jeff Davis counties to the east. Sierra Blanca, the county seat, is seventy miles southeast of El Paso. Hudspeth County. Formed from El Paso County; created February 16, 1917, organized August 25, 1917. Named in honor of Claude Benton Hudspeth born in 1877. A native Texan, holder of larger ranching interests, member of the Texas Legislature and the United States Congress. Sierra Blanca, the county seat. Historical Marker text, 1936 (Centennial Marker). Marker location: located at intersection of Business IH-10 and FM 1111, Sierra Blanca. 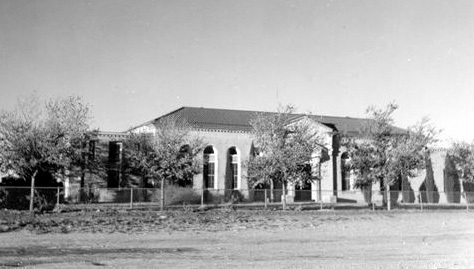 The Hudspeth County Courthouse, shown at right, built in 1917, is the only current adobe courthouse in the State of Texas. The adobe walls of the building are 18 inches thick. Hudspeth County Courthouse from Texas Escapes.